1.Cut carrots and daikon on largest holes of box grater, mandolin-style grater or spiralizing tool. 2.In large skillet, heat avocado oil over medium heat. Add chili garlic sauce and ginger; cook 1 minute, stirring frequently. Stir in green onions, mushrooms and snap peas; cook 2 minutes, stirring frequently. Stir in carrots, daikon and salt; cook 2 minutes, stirring frequently. 3.Remove skillet from heat; stir in sesame oil. Serve topped with peanuts and basil, if desired. 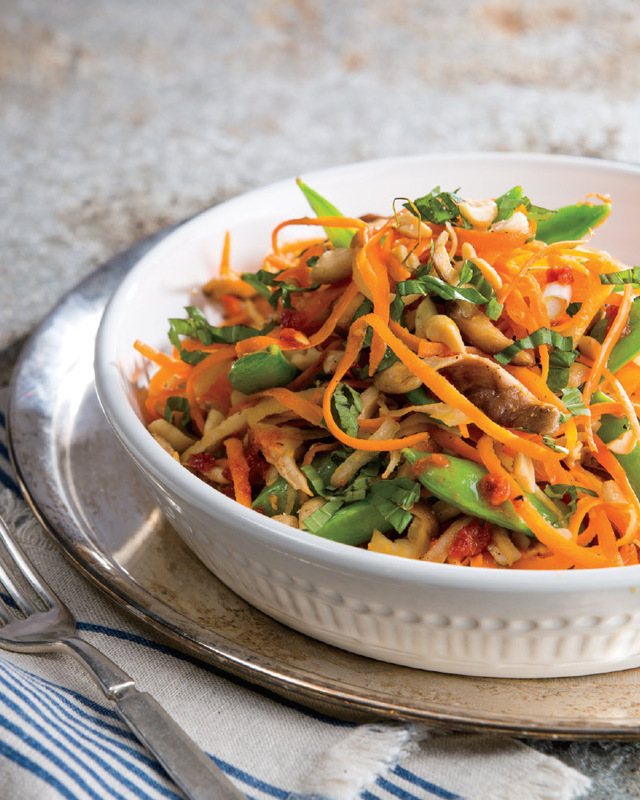 > Prep your veggies in bulk at the start of the week, or buy the pre-prepped blend of fresh stir-fry veggies from your Martin’s produce department to use as the base for a quick meal.